If you think mini coaches then the name Alan White won’t be very far from the forefront of your mind. He is celebrating 40 years of working in the industry this year and Kirsty Flatt travelled to Doncaster to get to know a bit more about the man behind Minis to Midis and the latest additions to his range of vehicles. Alan’s career history has been well documented and by his own admission, the best job he ever had was as a coach driver for Leon Motors in Finningley which was also the worst paid at the time! He progressed from being a bus driver but continued on a part time basis whilst working in engineering for a local tractor manufacturer. In 1985 an opportunity arose to join Coachcraft in Doncaster, a converter run by Mick Mullins, as Transport Manager. Alan got involved in running local bus transport and experienced ‘a few run ins’ with South Yorkshire Transport. Fortunately Mick gave him the opportunity to move into sales selling conversions that were previously sold through Crystal. Alan remained with Optare until April 2004 then set up Alan White Coach Sales and became an Optare agent. He was also Deputy Chair of the Suppliers Section at the CPT until 2004 and continues to be a member with Minis to Midis. Later that year, Alan was approached by Danny McGee at Esker to become their UK agent. He felt that the company wasn’t big enough to handle the importation side of the business and so he joined them as General Manager to oversee the sales in England and Wales, which he did under consultancy of the Minis to Midis brand having since closed Alan White Coach Sales. The contract was for three years but he remained for three and a half. At the end of the consultancy contract, Alan became an agent for Esker selling their vehicles until 2009 when Esker ceased trading. The focus then switched again to Optare products and to Caetano UK selling the Toyota Optimo. 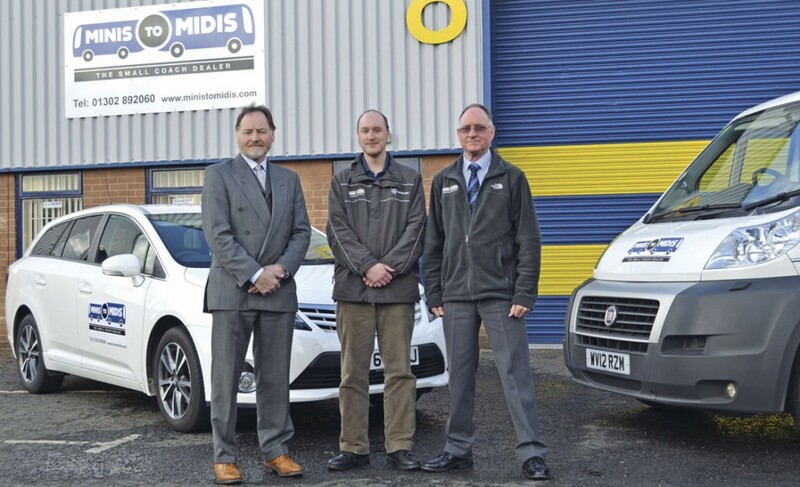 Once Unvi decided to import directly to UK, they appointed Minis to Midis as their agent as essentially it was the same products that Esker had sold and the Optare range was relinquished due to conflicting products. From 2009 to 2012, Minis to Midis was essentially an Unvi and Caetano UK dealer. Due to internal issues and the logistics of how part of the operation was managed, it didn’t suit Alan’s business model and with this in mind they looked for another company to match their profile, although Alan admits that in 2012 he did consider retiring! He had met Mark Noone in the past through his Irish connections at Esker and knew he was launching a Vario based coach, the Turas 800. He also agreed a deal with Paramount Conversions and pulled out of the Unvi dealership completely. By September 2012 he was a Noone and Paramount dealer. The projected sales for the T800 was 15-20 for year one in Britain. They sold 100 in 14 months, between themselves and Noone. 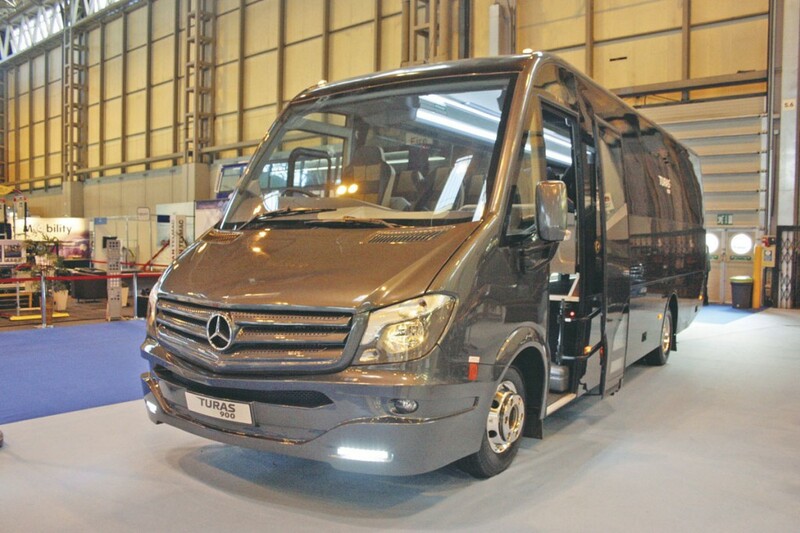 Next to follow in the range was the Sprinter based Turas 500, which was also coach built. Noone also decided to launch their own Sprinter conversion range branded Turas 500C and because of the conflict in interest, Alan stopped working with Paramount. There are three ‘lines’ to the T500C; the mid luxury M line, the Hi line and top of the range Top line. In April 2014, the last of the T800s came off the production line and so in 2014, the conversions were a key part of their business. There are two new products on the market this spring which will complete the range. The Turas 900 is built on a Mercedes Benz Atego 9.5 tonne truck chassis where the driver is normally seated to the side of the engine. Noone’s innovative design means the driver is now positioned further back and the nearside entry door allows easy access for driver and passengers. Although it is not a direct replacement for the Vario, they wanted to retain the high teens mpg it achieved, whilst keeping a low GVW. Alan referred to it as an ‘Enhancement from the Vario product’ saying that because the Vario was a somewhat dated but well proven chassis, the Atego offers a more refined solution. At 2.4m width, it is still suitable for many operators in rural locations and having up to 33 seats plus courier, it is a serious contender for the new ADL Cheetah. It offers up to 6m3 of luggage space so is also ideal for airport runs. 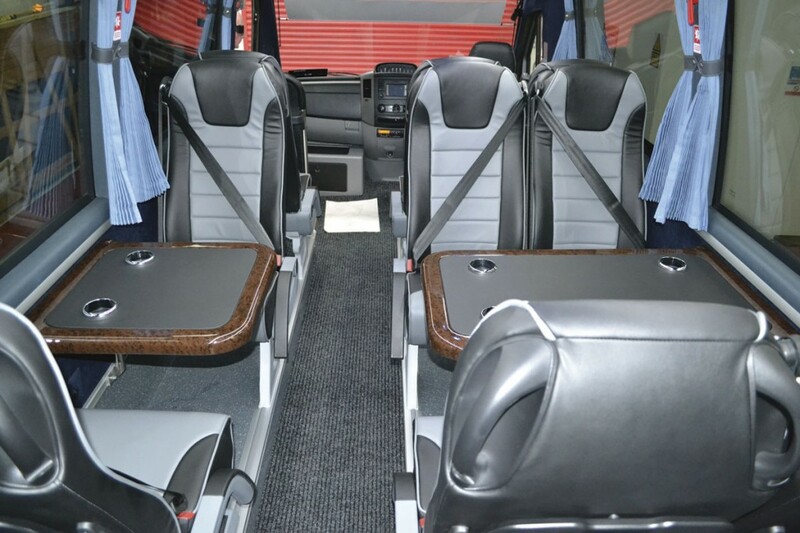 There are various specifications available but with Noone’s and Minis to Midis’ wealth of experience and market knowledge they are confident that they know what customers want from a midi coach of this type. The projected sales for year one were 70 vehicles and they already have orders for 50, with three more coming in on the day that I visited Alan. Although this sounds as they are well on course to achieve their target, one must consider the seasonal buying market for this type of vehicle. By the end of this month the Turas will have become a full product range in less than three years. They are so confident about the quality of their vehicles, that they offer a two year warranty and should an operator wish to sell their Turas back to Minis to Midis five years after purchasing, they will offer them 50% of its original net value in part exchange subject to normal appraisal, assessment and mileage conditions. They have a body support service network in place with two more service agent appointments pending that will take the number to eight covering from Scotland to the south coast of England and Wales. 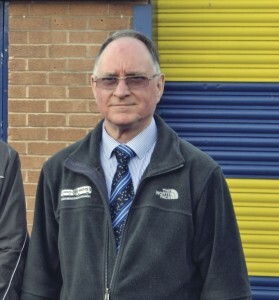 The Midland’s region is covered by themselves from their Doncaster base with Alan’s brother, Steve, who has a previous service and sales background but trained as a commercial vehicle fitter. GB Fleet Maintenance (Golden Boy) is the main agent just north of London. 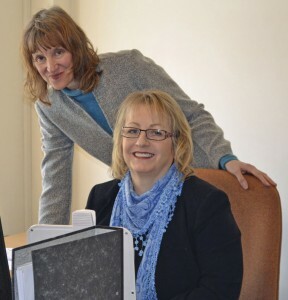 Linda Trees (seated) with Alan’s wife Kathryn. His wife Kathryn, whom he refers to as ‘the real unsung hero’ and himself are the sole owners. Kathryn’s area of expertise is accounts and administration and they have worked together for many years, she was responsible for putting Autobus Classique sales system through its ISO 9001 certification. Their son Jamie is, in Alan’s words ‘there by default’ and is responsible for managing parts and stock. Although their other son, Tim, doesn’t work for Minis to Midis, he was instrumental in setting up the IT systems and website with his wife who also previously held a role within the company. Steve White is the Operations Manager and his partner Linda Trees also works in an administrative role within Minis to Midis. They are currently looking for a full time Sales Administrator, another sales person and possibly a workshop trainee to join the team. They outsource some of the lead generation to a telemarketing company that specialise in the coach and bus industry. Outside of work, Alan likes to go walking, particularly in Scotland although he loves Guernsey and has been returning there since a school trip, aged 12. He used to own a Harley Davidson which would be used for weekend jaunts, but he hasn’t had one for four years now and these days he prefers to use his car. He and Kathryn are both National Trust members and spend a lot of time exploring their properties. So, what grinds the gears of someone with an urge to write a children’s novel? Alan, needed little time to answer, ‘Poor service, in anything. Being polite costs nothing. If you were to ask Kathryn, she’d say rubbish, she hates seeing litter all over the place.’ A tour of the showroom area confirmed this with an array of spotless, perfectly labelled, recycling bins placed in the corner. Alan is in the process of leasing another unit across the road which will then become the showroom and the current premises will remain as the head office, parts and handover area. To view some of the Turas range, visit Alan and his team at Unit 8, Guildhall Industrial Estate, Sandall Stones Road, Kirk Sandall, Doncaster, DN3 1QR.